22 x 24 x 10 in. Two columns of books emulate New York Citys, World Trade Center Twin Towers that were destroyed on 9/11 by terrorists in 2001. The various volumes of book titles represent the diversity of people and ideologies that might have been found within the office building on the day of the attack. 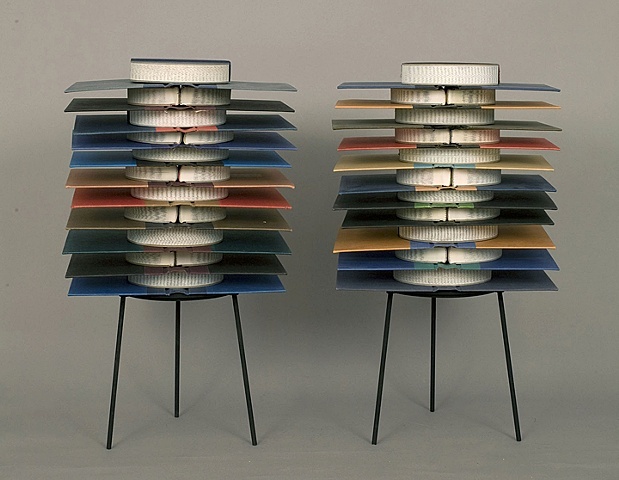 The books precariously sit on top of two metal rings with steel legs. The circular core of books references the internal structure of the Twin Towers that toppled when the planes crashed into them.